crotchhiguy had the most liked content! I know it is not skating but I found something for the diver that wants to be in style. 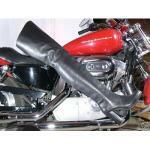 More pics on google,type in high heel dive fins. The 2019 fall fashion trends post was ok for nothing more than to look at and dream. Most of us here will never spend that kind of money on a pair of boots due to either not being financially able or common sense. What would be of better use would be a fashion report of what the average retail stores have to offer.....stores such as dsw,rack room shoes,your big anchor stores at your local mall, and others that sell to the average person and not the rich. Very seldom will you see any of the styles that were in the 2019 fall report being worn on a daily basis. The old Sears catalogs of many years ago,was a good indicator of what kind of styles you would see on the streets....too bad that they are no more. Sorry, I meant how high up your leg do they go,ankle,to the knee,over the knee,thigh high, or crotch high? Nice boots!!!!! How tall are they? Lucky you!!!!! They look like they fit you perfectly. Nice boots there!!!! 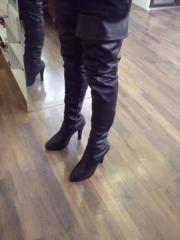 Sam Edelman makes some excellent quality boots. I found a pair of their black leather over knee boots a few weeks ago at Unclaimed Baggage in Scottsboro,AL for $40 in like new condition. Unfortunately, my ladies sz 11 foot would not squeeze into a sz 8.5. If you are ever laid over in Birmingham, AL or Chattanooga, TN, it would be worth your while to rent a car and make the drive to their store. Boots are seasonal so don't waste time going in the summer. They have a little bit of everything there and at good prices. Call me if you know ahead of time that you will be laid over at Birmingham and maybe we can meet up. Merry Christmas and Happy heeling to you. good looking boots there,they look very similar to a pair of Nine West pull on tall shafts right at the kneecap boots that I bought years ago. 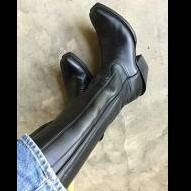 Check out motorcowboy.com That is where the boots in my avatar picture came from...sz men's 10,crotch high,all leather,leather lined...easy to wear and walk in. What size do you need,Boothill???? I might have a few pairs that you would be interested in for sale. Here's some pics of me wearing 4 inch black patent pumps,stockings and a denim skirt.....only legs and heels are showing.....that is what this contest is all about,right? I wil post some pics of me with bare legs and wearing heels later.Enjoy! What size are the red pleaser dagger boots and what is your price on them? Thanks. Name of style of boots,price,and purchase location please.......thank you!